German Techno producer, DJ, radio host and label founder. Born on 11 December 1968 in Gießen, Hessen (Hesse), Germany. 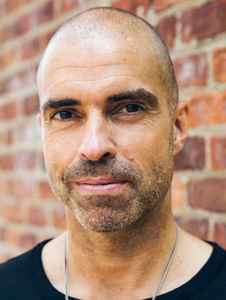 Chris Liebing had his first Residency as a DJ in a small club called "Red Brick" 1991 in Giessen, near Frankfurt. Already beginning of 1995 the club had to close down and Chris began working for Eye -Q Records in Frankfurt. During that period, he met his friend and partner Andre Walter. Together they started to built up a studio and worked on music. In November 1995, Chris had a chance to play at the OMEN in Frankfurt and shortly after became Resident DJ. About a year later, influenced by his DJ-ing, he created "fine Audio Recordings" together with Under Cover Music Group. Chris gained first worldwide recognition with releases like Audio 07 and Audio 11. In may 2001 he mixed this double CD and started working on his Album for CLR which will hopefully be released within the following year. 2003: Chris Liebing won the German Dance Award in the category best national DJ, also nominated were Paul van Dyk, Sven Väth & Westbam. Chris Liebing is one of the biggest hitting techno stars of all times. Period! His fierce often harsh and dry approach to music always comes with a highest of the highest focus and professionalism. The guy is invincible and is to be followed by future generations. Bravo!!! Chris Liebing has got to be one of the most talked about personas in the history of techno, despite the fact he hasn't been "there" since day one, he's everything but a true innovator (production wise), and as far as his DJ skills go, while competent, they hardly make him qualify as a deck wizard. So, what is there to talk about? Really? Well, his charisma and undeniable consistency on the scene make Chris one of those guys who are always relevant; time goes by, trends change and evolve, but despite of it all, he's always where the action is, if you follow me. First, the production. Chris Liebing has never produced a genre bending track, or anything even remotely experimental or mind challenging for that matter. Best of all is, he never even tried to. He prodcues straight forward, hard, percussive and banging techno that makes people jump out of their shoes. You know, the type of a track that you've waved your fist in the air countless time to. Basically, head nodding, simple, repetitve techno that mixes well with anything and screams "Have a good time all the time y'all!". However, don't be mistaken, despite being liberated of virtually any mind expanding characteristics, his production, especially his early classic works on Fine Audio Recordings, have had a huge amount of impact on the entire wave of german hard techno/schranz style. His tracks have been in many a cases of one too many DJs for weeks and are still favorites at many parties. His Stigmata releases are to blame for my great appreciation for hard techno, they are everything but original, but the amount of energy and intensity put into them left no club and no party goer flat. Trust me. Ever since he started his own CLR imprint, his production output has dropped in quality in my opinion, despite having dropped a decent 12" here and there, such as the Analogon EP and the American Madness EP, or his club killer tune, Golden Age. His extensive remix catalogue has provided countless reworks of amazing tracks, my favorites being his takes on Ignacio's Virton and John Starlight's Blood Angels. Recently, he took the minimal route, together with so many of his contemporaries, but in his case, I find it hard to complain. After over a decade of tough, noisy and sometimes industrial tinged techno, my guess is that it was about time for him to try out something new, or at least, different. Personally, I will always remember him for all those amazing tunes he produced before 2004, or up until his Collabs 3000 album with Speedy J in '05. His mixing skills. A few cool filter sweeps aside, I don't think I've ever heard Chris Liebing pull off a more demanding trick behind the decks, let alone a complex mix, cut-up, sophisticated scratch or anything similar. Despite all of that, the man threw some of the greatest parties I have ever attended. In Zagreb, his gigs were some of the most visited during any party season, and time after time he dropped amazing two and a half four DJ sets, during which not a single soul stood motionless. Basically, all the man does is drop tracks, ranging anywhere from three minutes on, and then simply beat matches them without much showcasing or what not. Thing is, his track selection is always mighty fine! There is no way you'll find a single lacluster moment in 90% of his sets, even though his technique is very basic. When he used to spin hard techno (he's into the whole subtle minimal way of things now), he kept it all under the same roof: monotonous, percussive and samey tracks were on the menu throughout, so it all sounded like one long journey you wouldn't want to stop. That's the whole trick. He plays music for the people to really dance like nobody's watching, and that's what you see and get during his gigs. Whenever he spins, he's constantly communicating with the crwod, smiling, encouraging them to dance faster and harder - you can clearly see he's putting all he's got into every set. It's as though he's feeding on the crowd's positive energy and feedback, but gives back twice as much. Simple yet effective DJ sets, with modest skills, but an undeniable passion for what he does made Chris Liebing one of my favorite DJs back in the day. Overall, with residencies at some of Germany's most famous clubs, a label that spawned many club hits and exposed quite a few back then minor producers to a larger public, a consistent presence near the top for a decade now, in one way or another, Chris Liebing has earned his place. The thing is, he's one of the few people that does nothing more than giving his fans a blast. He never pretended to do anything more. He never in the past, and he might never do it in the years to come, raised the bar in techno music, but if this genre was originally all about fun and enjoying ourselves, then Chris Liebing is THE man who hit it all on the nail. And in the process, he has had a blast himself. Living proof of how you don't have to attempt to forge intelligent and thought provoking techno in order to reach the hall of fame. All it takes is heart and firm faith in what you do. Mr. Liebing has got enough of both to last a dozen producers and DJs. Chris Liebing is one of the most influential djs around today. I have seen him spin probably over 50 times and every time is awesome. His music may be repetitive, but that's what the kids like and that's what is fun to party to. Now that he is moving to softer techno I don't enjoy his sets as much, but I still count him as one of my favorite djs because of his passion for the music. I am happy that he has gotten so big because he deserves the credit for helping techno gain in popularity in the past couple years. at one time i had my doubts about this man's skill and dedication, as do most cynical technoists from detroit, but liebing has proved himself trifold in the past 2 years. from the st. andy's hall parties to i love techno, he puts his heart into everything he does, wherever he does it. and in turn, i love it. Sorry to be a downer but doesn't anyone else think that the esteemed Mr Liebing is the most overated man in techno. He's a decent enough DJ and i say that having only seen him once in Melbourne two years ago, but why does he desrve this much respect and praise i ask all of you? I mean he's been recycling the exactly the same soundsin his productions ever since he released those early classics on Audio. Time to move on Chris! Turned too popular. Easy...now everyone knows this kind of techno, there´s so many others! Germany Michael Jackson, you know what I mean. Once was very creative. But time can still give him a chance, if he look outside himself.